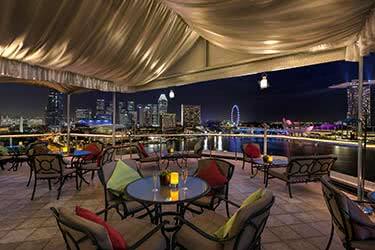 Location: This hotel is based at the forefront of the Singapore river. 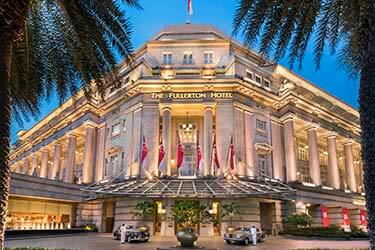 Today, The Fullerton is renowned for being one of Singapore's most prestigious addresses. 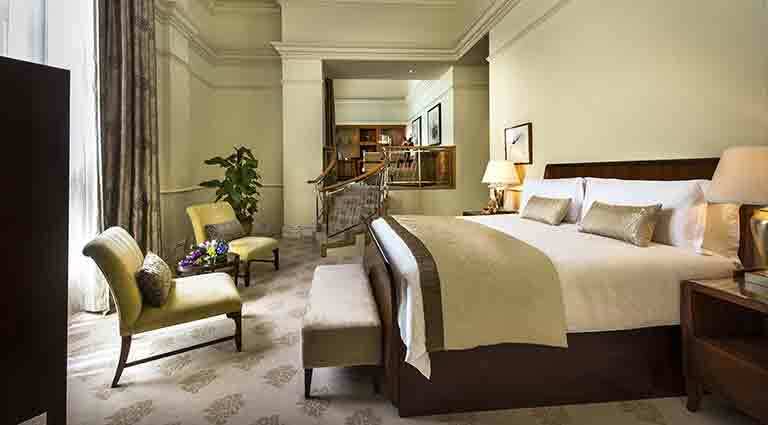 History: Once a post office, this hotel has now been renovated into one of the world’s leading hotels. 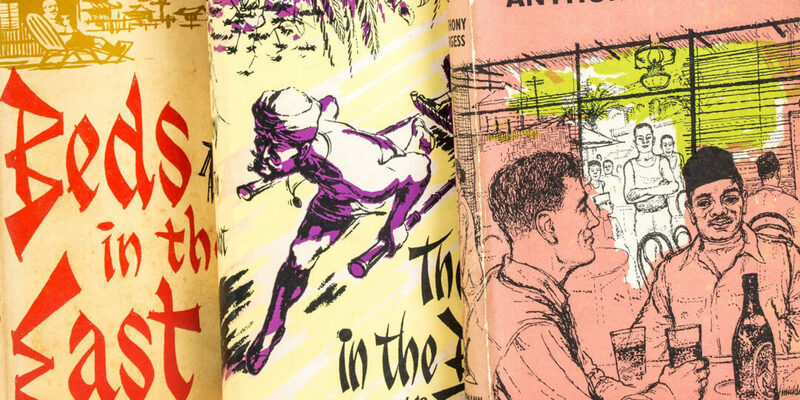 The Fullerton has an exciting and fascinating past. 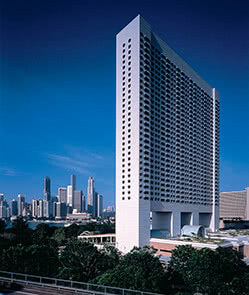 It was voted “Best Hotel In Asia” by the Conde Nast Traveler’s Readers Choice Awards in 2006. 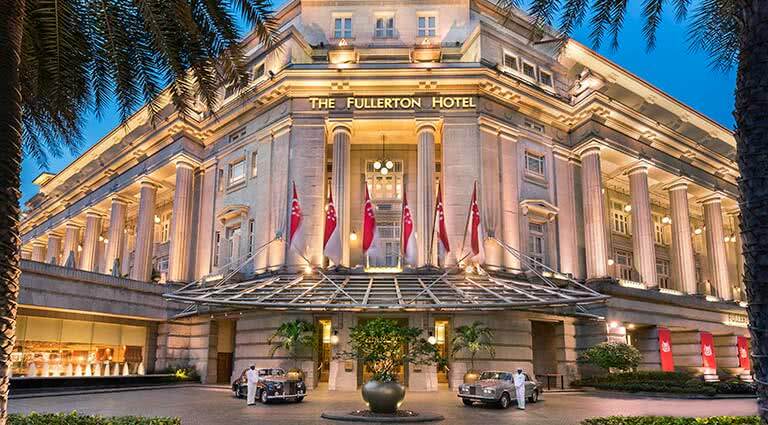 Service: The Fullerton is renowned for its legendary service, which has made it into the unequalled Singapore hotel it is today. 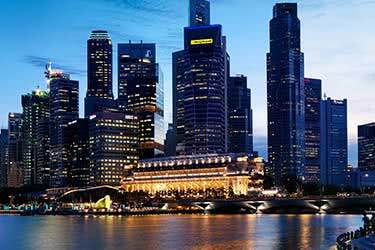 Offering luxurious accommodation in the heart of Singapore’s arts and financial districts, The Fullerton Hotel Singapore is a masterpiece of understated comfort and elegance. 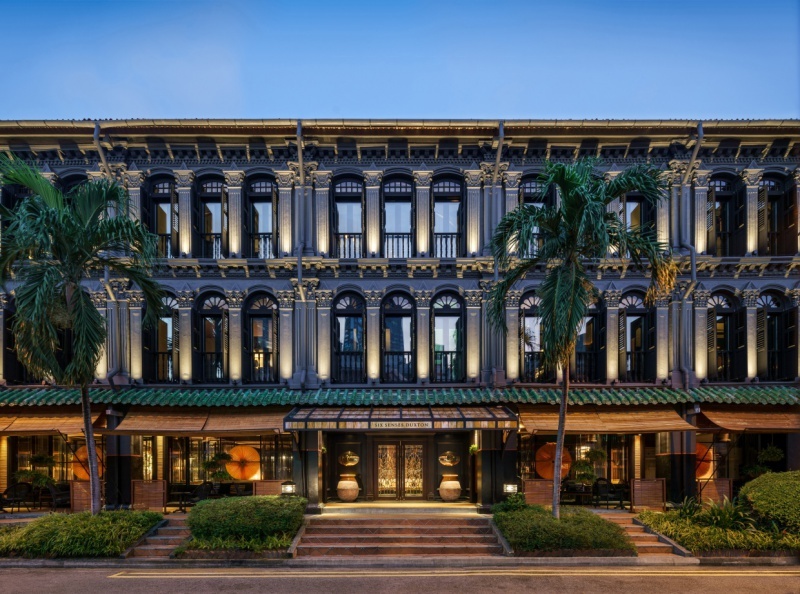 Transformed from the Fullerton Building, which was built in 1928, its rich heritage, neo-classical architecture and strategic location make it an inspiration to business and leisure travelers. 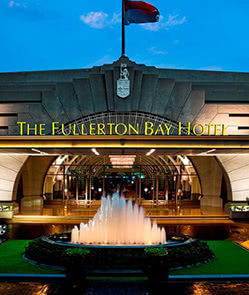 Just 25 minutes from Singapore’s Changi Airport, The Fullerton provides accommodation that surrounds its guests with a refreshing ambience of peace and tranquility. 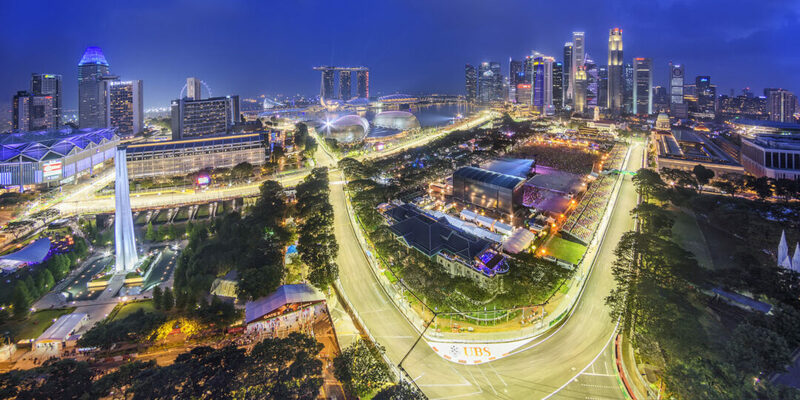 Views from the 400 rooms and suites are unrivalled in Singapore. Rooms overlook the sunlit atrium courtyard, or have verandahs that open out to sweeping views of the city skyline, the river promenade or the sea. Each category of guest room and suite is meaningfully named to reflect the building’s rich history. Each room features a private safe with a power point for the recharging of electronic devices such as laptops; coffee and tea-making facilities; mini bar; 29” color TV with local and international channels; music channels; and shoe shine and laundry services. Cutting-edge technology and high-speed Internet access provide each room with global connectivity. International Direct Dial telephones, data ports and voicemail are available in all rooms. In addition, a digital entertainment system allows enhanced options such as video-on-demand, games-on-demand and movie previews. 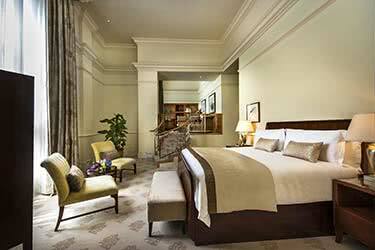 The Fullerton Singapore has a range of 400 rooms and suites offering warm contemporary style décor, high-tech amenities and home comforts. 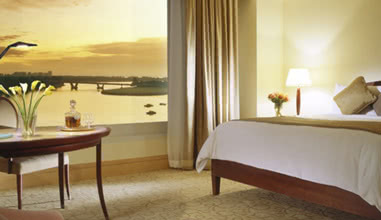 The spacious rooms overlook views of either the sunlit atrium courtyard, the city skyline, the river promenade or sea. 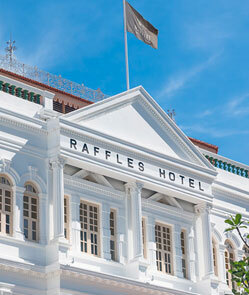 The stylish rooms reflect the hotels heritage as a colonial building from the 1920s. 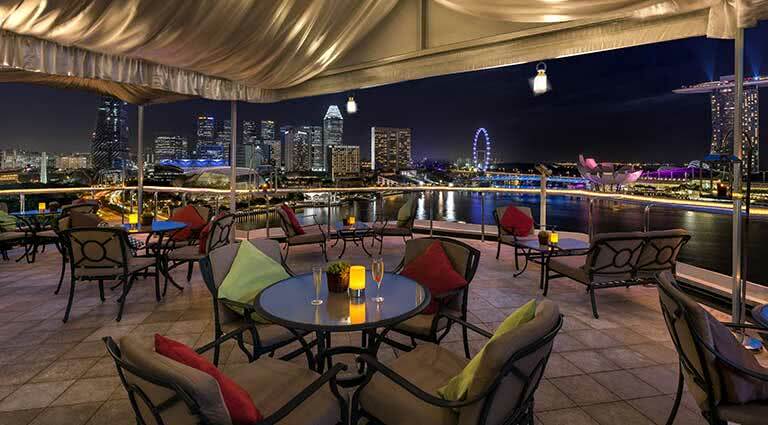 Quay Rooms overlook the picturesque bay outside or the historic Singapore River. 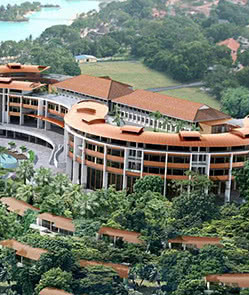 The large rooms have a classic elegant style to compliment the building’s colonial architecture. The rooms have comfortable beds, able TV, en-suite bathrooms with a bathtub and shower, and added extras including stationary, bathrobes and toiletries. The rooms are complete with high-speed internet facilities. Courtyard Rooms overlook views of the sunlit atrium lobby. 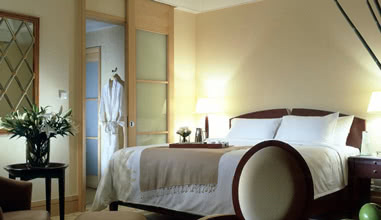 The large rooms have a classic elegant style to compliment the building’s colonial architecture. The rooms have comfortable beds, cable TV, en-suite bathrooms with a bathtub and shower, and added extras including stationary, bathrobes and toiletries. The rooms are complete with high-speed internet facilities. 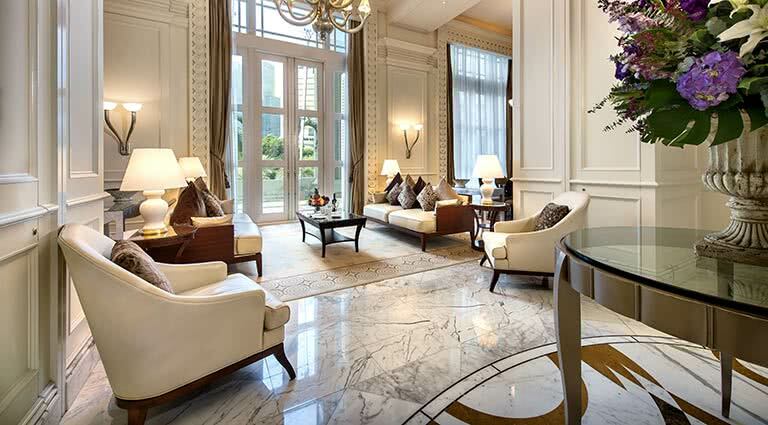 Post Master Rooms, take their name from the previous use of the historic Fullerton hotel building as a post office in colonial times. 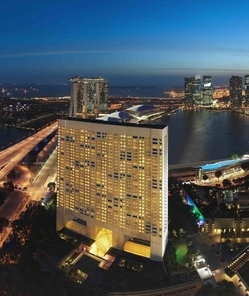 The beautifully appointed rooms boast scenic views of Singapore’s dazzling skyline. 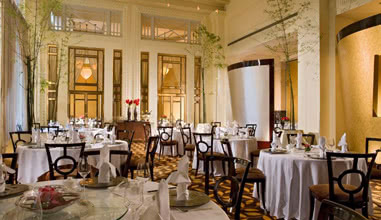 The large rooms have a classic elegant style to compliment the building's colonial architecture. The rooms have comfortable beds, cable TV, en-suite bathrooms with a bathtub and shower, and added extras including stationary, bathrobes and toiletries. The rooms are complete with high-speed Internet facilities. 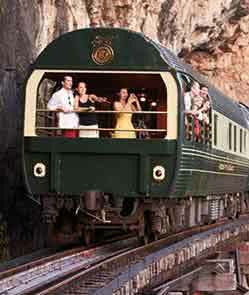 There is a host of facilities within the hotel to keep guests occupied without even having to leave the hotel’s confines. 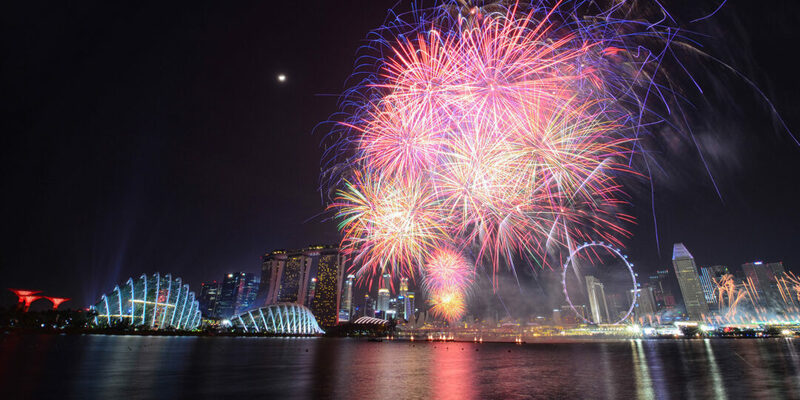 From the fitness center to the financial center, all the while keeping in shape at the five-star gym, or getting pampered at the luxurious Fullerton Spa, there is something to suit every guest here. Business travelers will appreciate the hotel’s business center, complete with a full range of business and secretarial services and utilities. 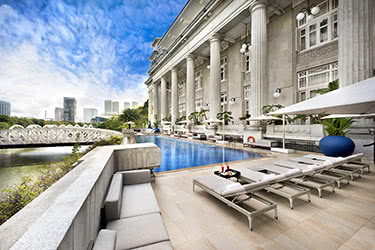 The hotel’s 82-foot outdoor infinity pool is a great place for guests to enjoy a relaxing swim, while looking out at the lovely views of the Singapore River. 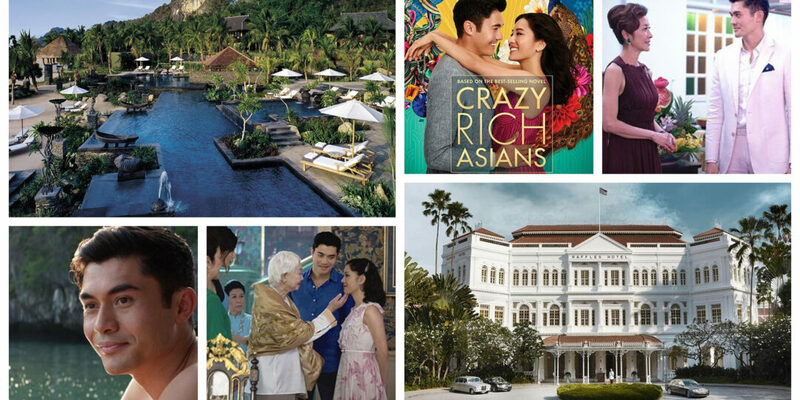 This well-known spa won the World Luxury Spa Award in 2013 for the Best Luxury Boutique Spa. It blends ancient Asian healing techniques with natural, handmade ingredients, all presented in a modern, luxurious setting. Guests can enjoy a variety of cuisine styles at The Fullerton including Chinese, Japanese, and Indian, which all cater to the highest quality standards, with highly-trained chefs using the finest of ingredients. 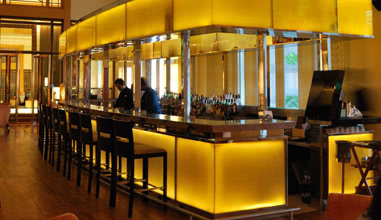 A trendy bar frequented by fast-movers and deal-makers, Post Bar has a style which is distinctively its own. 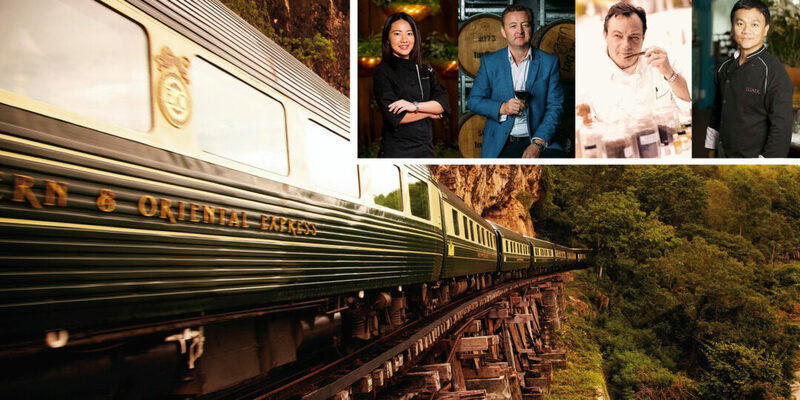 Guests can enjoy a quick business lunch or signature Fullerton Slings and the trendy ambience at the cocktail bar or private Music Room to contemporary and New World music. While Post Bar’s interior is sleek and trendy, with underlit honey onyx bar tables and standing artichoke cardboard lamps, classic design elements like the original wall motifs and lofty coffered ceiling from when it used to be the General Post Office’s transaction hall makes the décor heritage chic and truly unique. For those who prefer a lush al fresco setting, head to the bar’s adjoining outdoor East Garden. A menu of creative canapés is also available if you would like savoury bites to accompany your drink. 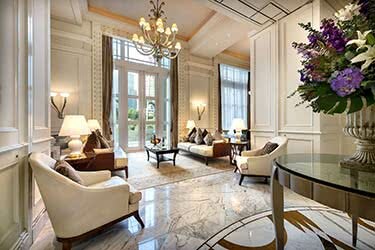 Located in the sunlit atrium lobby of the hotel, The Courtyard is where guests can enjoy a light meal, a signature Japanese or Indian Curry buffet, leisurely afternoon tea, the hotel’s famed chocolate buffet or an elegant cocktail. 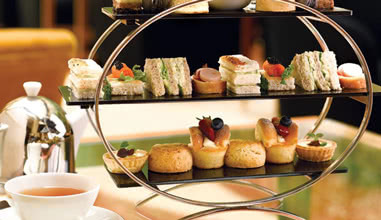 Be serenaded by live music in the afternoon, during afternoon tea. With plush sofas and an idyllic ambience, The Courtyard is a pampering experience. In the evenings, The Courtyard has the perfect casual yet elegant ambience to sip on your favorite cocktail and unwind, as the rhythms of the jazz quartet fill the air. Sitting at the apex of The Fullerton Hotel where lighthouse keepers used to guide ships in, this Italian restaurant is the latest beacon on the culinary scene today. 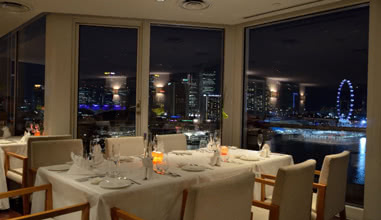 The Lighthouse features delightful Italian cuisine amidst a lovely ambience, complete with panoramic views of Marina Bay and the city skyline. The establishment extends to an exclusive private lounge on the rooftop, perfect for a pre-prandial cocktail or aperitifs after dinner. Savour Italian creations while basking in the breathtaking views that make dining at The Lighthouse an unforgettable experience. 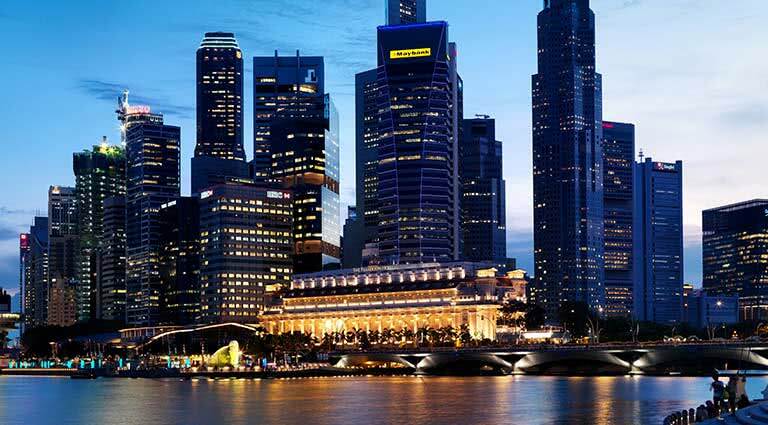 Town Restaurant, an all-day dining restaurant, is ideal for a power breakfast, business lunch or idyllic buffet dinner whilst enjoying views of the Singapore River. 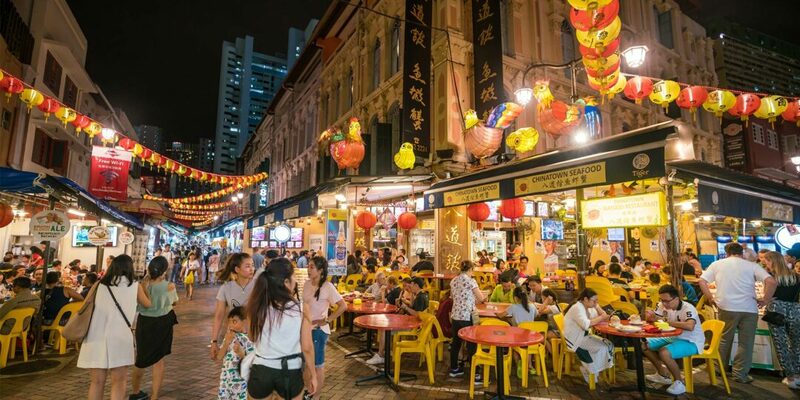 This vibrant restaurant will take you on a global gastronomic journey, with its focus on refined international flavours from east to west. 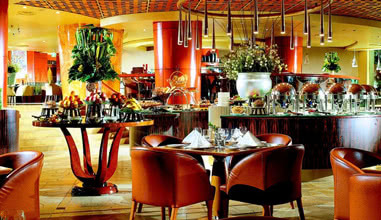 Guests enjoy a choice of a la carte signatures or hearty buffets. On Sundays, Town Restaurant is one of the top choices for brunch in the city and comes alive with merry making and gourmet indulgence.